I received a press release from the grey Lubyanka a few days ago about the revamp of the skate park at the rear of Oak Park Leisure Centre, a project which I must confess that i wasn’t aware of. I don’t really roll with running press releases here on the blog, but since this is a positive thing for the youngsters in the community, I have no problem with reproducing it here. The kids in the Northern Wastes don’t get much of a break and it’s nice to see something being done for them. This Saturday, 10th July there’s going to be a barbecue and lots of stuff going on, including the chance to meet the local constabulary without being shook down against a wall, which will be a welcoming change for the kids of the area. Looks like being a great day. The Brownhills Blog will be offering a roving reporter award for any submitted photo of the event showing officialdom desperately trying to get down with the kids. Bonus points will be awarded for councillors wearing hoodies, PCSO’s doing halfpipes or council workers dressed in Emo gear. Up to 80 youngsters are expected to roll up to the launch of a refurbished skate park at Oak Park Leisure Centre on Saturday 10 July. £88,000 scheme – paid for with a grant from the Youth Capital Fund – has involved overhauling existing equipment, installing new and improving drainage on the site so it can be used even in wet weather. 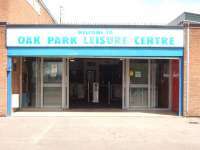 Oak Park - not handsome, but we love it. Detached youth workers from the council’s Integrated Young People’s Support Service worked with local young people to organise the refurbishment with support from Oak Park Leisure Centre, local police and police community support officers, and officers from the council’s greenspaces and parks maintenance teams. Cabinet member for children’s services Councillor Rachel Andrew said: “This is a great example of us listening to young people and working with them to create positive things for them to do in their spare time. “Youngsters were directly involved right from the design stage and have been continuing to use the site while work has taken place. The skate park’s official launch will be on Saturday July 10 – coinciding with the start of SHINE WEEK which runs from the 10-18 July to promote National Positive Activities for Young People. Local police community support officers are attending to offer young people free bike security marking and Pelsall Community Watch volunteers will also be there cooking up a free BBQ for the skaters. This entry was posted in Brownhills stuff, Environment, Events, Fun stuff to see and do, Local media, planning, Shared media, Spotted whilst browsing the web, Walsall Council, Walsall Wood stuff and tagged Oak Park, Walsall Wood, Walsall Wood Skate Park. Bookmark the permalink. Nonetheless, well done on a great community effort. It’s nice to see some stuff being done for the yoot.